In Heartland Organics, Inc. v. MC Developments, LLC (1D08-5029) the First DCA reversed the decision of the circuit court transferring venue to Miami-Dade county and certified conflict with Sinclair Fund, Inc. v. Burton, 623 So. 2d 587 (Fla. 4th DCA 1993) to the Florida Supreme Court. The trial court transferred the action based upon the joint residency rule developed in the Florida Supreme Court's opinion in Enfinger v. Baxley , 96 So. 2d 538 (Fla. 1957). 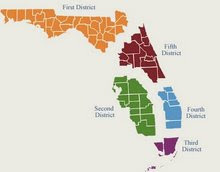 "In Enfinger, the Florida Supreme Court set out the joint residency rule, which requires that when a natural person is sued along with a corporate defendant, and there is a county in which both the individual and corporate entity reside, venue is proper only in the county of joint residency. 96 So. 2d at 540-41." The Fourth DCA held in Sinclair Fund, Inc. v. Burton, 623 So. 2d 587 (Fla. 4th DCA 1993) "that in a contract action for payment of money, venue was not proper where payment was to be made, but was only proper in the county in which the individual and corporate defendant jointly resided." The First DCA rejected Sinclair Fund and held "[w]e reject this interpretation of Enfinger, and certify conflict between Sinclair Fund and our decision in the present case."